Are vending machines the answer to female health? Wow! Vending machines have really been in the news lately, with a special spotlight on Shippensberg University’s health care vending machine. When surveyed, 85% of students at Ship U. responded that they would be interested in a vending machine at their student health center. 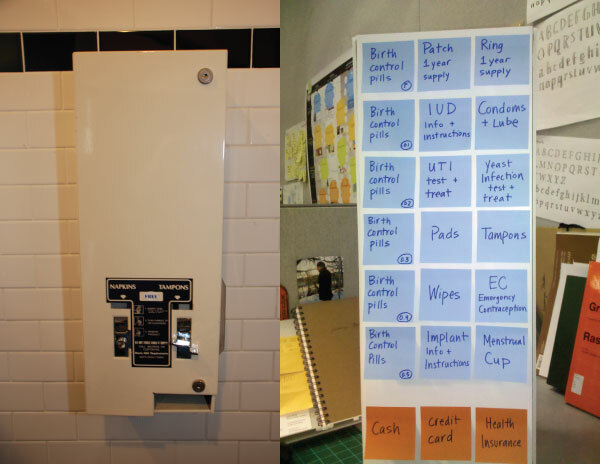 Students buy hundreds of doses of emergency contraception from the machine each year. Pregnancy tests are also available. According to their website, they’ll be adding condoms to the machine soon. The school released a statement on their website about the availability of Plan B to their student population, and why they chose the vending machine system. It’s exciting to see this idea in action in the real world! 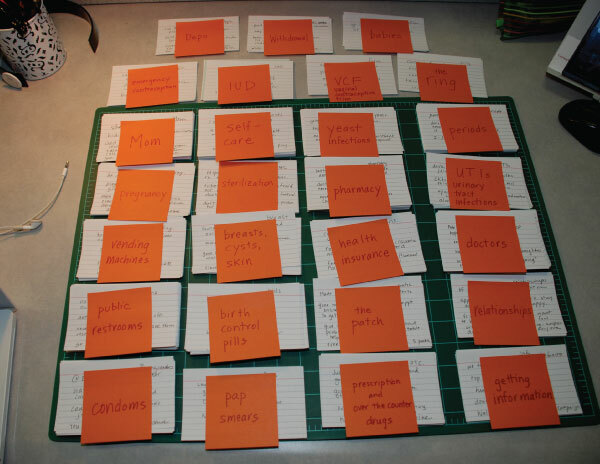 Back here at CMU, I continue to work on my thesis project developing a female health care vending machine design. 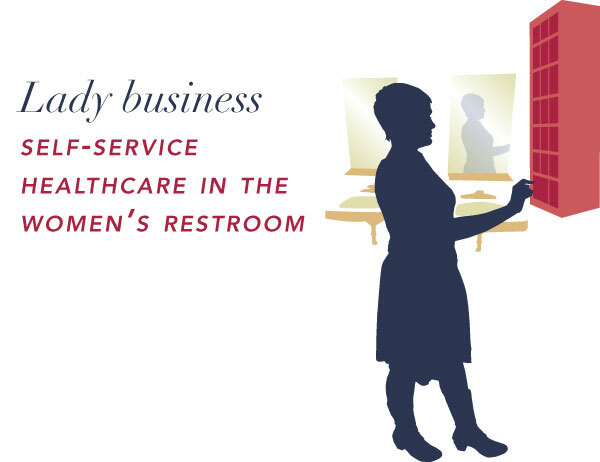 Over the past few months, I’ve nicknamed my self-service healthcare concept “Lady Business.” I recently presented the Lady Business project at the TEDxCMU finalist auditions here on campus. I didn’t make the final cut, but it gave me the opportunity to share the project with a group of students from other majors, and I wanted to share it here online. The model in the images is Loretta Neal, a fellow design student. The idea for Ladybusiness came to me last summer as I was hiding in a small room at work, making secret phone calls to my nurse practitioner back home. I was trying to convince her to refill my prescription for birth control pills. My prescription from last year prescription had run out, I was in a new city doing a summer internship, I didn’t have a local doctor, my health insurance had just changed, and the pharmacy nearest to me closed early. 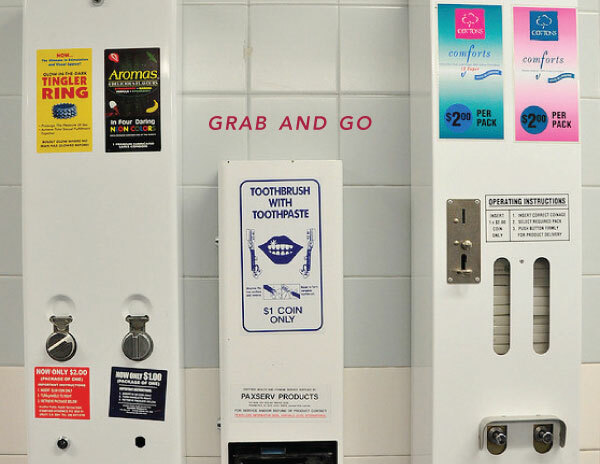 Current vending machines offer up tampons and pads, but what else could go in the machine? So, I picked this as my thesis topic and started doing research this fall. I interviewed women to find out what experiences they were having with their health, and it turns out, I’m not alone. Women told me their stories of visits to the gynecologist, trips to the pharmacy, problems with health insurance and their experiences with common infections like UTIs or yeast infections. Having to overcoming barriers to access care, ranging from problems with administrative bureaucracy, cost, having no insurance or being dependent on someone else, which compromised their privacy. Mom knows when a young women on her parents’ insurance goes to the gynecologist because the explanation of benefits gets mailed back home. Some women end up going to Planned Parenthood and paying in cash instead of using their own health insurance. So, they have insurance, but it compromises their privacy to use it. Some women don’t have insurance at all, and therefore don’t really have access to contraception bedsides what they can buy on the drugstore shelves, which are one-time use barrier methods, like condoms. They aren’t able to access more effective, long term methods because they require prescriptions. One woman told of a day when she was getting a haircut and her hairdresser seemed unusually upset. The hairdresser eventually apologized and said she was suffering from a very bad UTI, but her doctor refused to give her a prescription for antibiotics until she came into the clinic for a urine test, despite having had UTIs in the past and knowing the symptoms were. The woman, unable to leave work, had to spend the day giving haircuts in extreme pain. The burden of time, from having to take time off of work or school to make appointments, getting to a clinic, waiting in waiting rooms, exam rooms, pharmacies, or for the mail to hopefully arrive on time. Taking care of your health means going through a complex system in which you must rely on others to give you what you need, and that takes time. One CMU student reported that she went to student health twice in an attempt to get birth control and eventually gave up, because they wanted her to make a third appointments for a full exam. Another woman says she feels like she’s playing Russian roulette every month when she receives her birth control pill in the mail, because if it arrives late and she misses a few days, she experiences pain. She’s one of 14% of birth control pill users who take it for therapeutic reasons. Feelings of shame are felt by virtually every woman when she has to face another person to ask for what she needs. Women talked about fear of being judged at the cash register at the pharmacy to buy condoms, even tampons! Women feel ashamed when dealing with health care providers that they feel don’t listen to them, or when they feel their privacy isn’t being protected in a place like a pharmacy. One woman was horrified when she went to a pharmacy to buy, and the pharmacist went around to every other person working in the pharmacy to check and verify if it was okay for her to buy two boxes. She left with about four or five people knowing that she needed EC. Another married woman told me every time she buys condoms, she’s afraid that the cashier thinks she must be running around on her husband! Some women say that they’ve discovered that the self-checkout at the grocery store is the best way to buy female products to avoid the unpleasantness of a face to face interaction. Fear of facing a cashier makes taking care of your female health needs unpleasant for many women. The protective barriers put into place to prevent women from having access to medicine and contraception make it difficult for women who need it to obtain care. The paternalistic attitudes of healthcare community are not science-based. Doctors treat ladies like “damsels in distress” who need to be protected and monitored. This attitude creates a hindrance for women who want to decide for themselves. Some pharmacists think women can’t handle the drugs without their help and control. During interviews, they expressed Irrational fears such as people “gobbling down the entire pack of pills,” or “Someone will find out a UTI treatment has antibiotics and they’ll buy it and take it for the sniffles.” These silly fears are used to keep medications under lock and key. In Australia, birth control is available over the counter with a blood pressure check and medical history. In the US, often a pelvic exam is required. Let’s look at a typical customer journey for a woman who wants oral contraception. She makes her decision, then begins the search for a provider. She’ll call a clinic or make an appointment online and hopefully schedule a visit a few days or weeks away. She’ll then drive down to the clinic, wait in a waiting room, have a pelvic and breast exam, pap smear, medical history discussion, and then the doctor will select a prescription for her and give her a piece of paper with the name of the pill, granting her permission to go get the pill. She’ll then drive down to the pharmacy, where she’ll drop off her prescription, wait, and then pick up 28-day supply of pills. She’ll either pay with her insurance, which limits her supply to 1-3 packs at a time, or if she doesn’t have insurance or her insurance doesn’t cover birth control (as is the case with two women I interviewed), she’ll pay out of pocket, anywhere from $10-70/pack. After a year, her prescription will run out and she’ll have to return to the clinic to have another exam and request a new prescription. The idea of this system is to screen women to prevent contra-indications, or negative side effects. But because the pill has been in use for so many years, and is taken by so many women, it is generally considered safe for healthy women under 35 who don’t smoke. Serious side effects are rare. So, the protections become a barrier for women who don’t have access to this kind of care, and it places a very high burden on the woman to keep up with this level of care in order to stay on the pill. To put this in perspective, women have 30 child-bearing years, but most contraceptions are designed for one-time use like condoms, or supplied for one month at a time, like pills. To avoid an unplanned pregnancy, this means dozens to hundreds of trips to doctors and pharmacies. More effective birth control is harder to get, because hormonal methods are available by prescription only. What are the consequences of making birth control hard to get? 50% of pregnancies in the US are unplanned (CDC). So, in this journey to get an everyday contraception like birth control, the woman deals with several people she makes trips to several places and she takes time out of her day. This is not just about birth control, women have to go through the same routine for common infections, like urinary tract infections or sometimes yeast infections. There are many obstacles that make these journeys difficult or impossible for women to get care. But I think it doesn’t have to be this way. Let’s take another look at these vending machines. First, they’re found in public bathrooms everywhere, at work, at school, in shops and restaurants…everywhere women already are. There’s no phone call to make, no driving around, no special hours, no appointments, permissions or conversations. To find one, you just have to go to the ladies’ room. So, the biggest advantages of these female product vending machines is that they already exist. 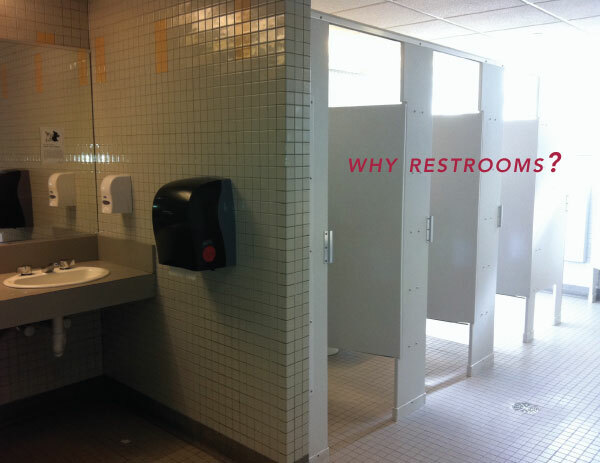 It’s a place women can enter and leave at their convenience, it’s not a separate trip, it’s women-only and anonymous. So, what is this vending machine all about? Well, we’re all familiar with the big, clunky vending machines we see in public bathrooms. They’re everywhere, especially in women’s restrooms, but if you’re like most people I’ve talked to, you rarely use them. My idea is to re-claim this small vending space and re-design it, to dispense a variety of women’s high quality healthcare products. I’m proposing a radical departure from the current healthcare system that requires women to make doctor’s appointments and go to pharmacies for needs as simple as birth control pills, treatments for urinary tract infections, some treatments for yeast infections, that are designed to facilitate self-diagnosis, self-treatment, contraceptions, as well as products for the period. Let’s make things clear. What I’m proposing is a radical departure from the current health care system in the US. My project proposes to make many prescription-only treatments over-the-counter in order to make them more accessible to women. You see, the problem with restricting things like birth control pills, antibiotics, and other prescription products, is it denies the women a chance to consider a range of options and make an informed choice. Instead, a medical provider is making the choice for her, with drugs that are unfamiliar to her and aren’t designed and packaged for consumer use. Therefore, women sometimes feel like they’re flying blind when it comes to selecting contraception because they can’t see the choices in front of them. Or they feel frustrated and helpless when they have a UTI or yeast infection and can’t get treated until they see a doctor, even if they know what they have. Women aren’t able to buy antibiotic treatments over the counter for common infections like UTIs, yet often it only takes a series of questions to determine if a woman has one, and can be diagnosed over the phone with 90% accuracy. However, some doctors insist on women coming in for a lab test before prescribing treatment. Now let’s talk about the concept of self-service. Once upon a time, you had to ask someone for help to make a phone call, pump gas, buy a plane ticket, or take a pregnancy test. While many services have been converted from a personal service to a self service, health care for women remains very dependent on permissions, gatekeepers and access to expensive insurance, and healthcare providers. By converting the most common female healthcare needs into a self-services, a woman saves time, encounters fewer barriers to care, and doesn’t have to face anyone to get the products she needs. Packaging could make it easy to test, treat, and refill on women’s health care supplies. 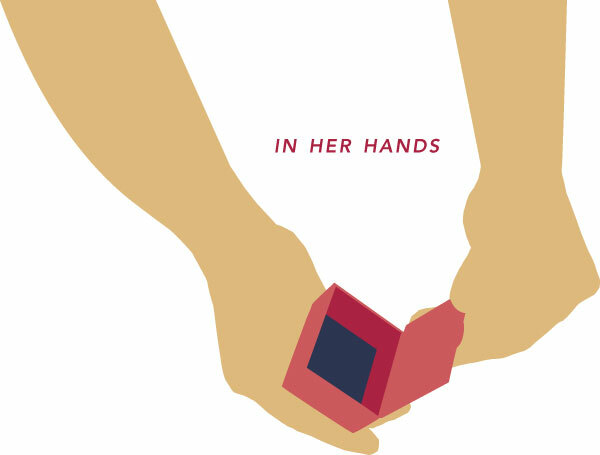 Packaging could be an educational tool to help guide women’s choices. Women in Mexico are more likely to use birth control pills since they’re available over the counter, but they’re less likely to be on the right type of hormone mix. This is an issue that needs to be address in the way medicine packaging is designed for the consumer. Women should be able to self-screen for contraindications. 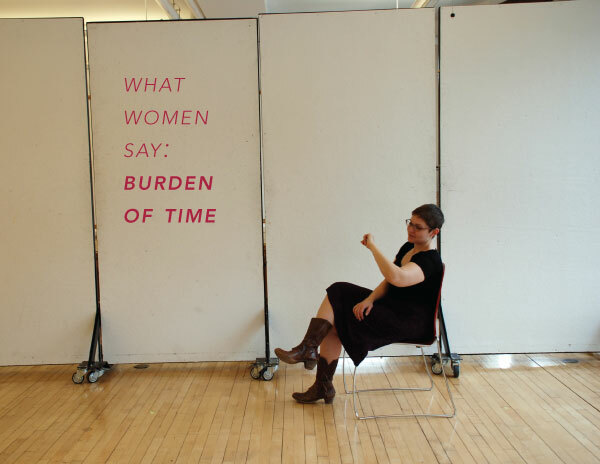 In fact, it seems a woman is more likely to be honest when asking herself questions versus being asked by a health care practitioner — avoiding what’s known as “courtesy bias,” or responding “no” to questions about health conditions that could be used as a barrier to receiving the desired treatment. Instructions and packaging are an important part of the design, because women will need to know how to select the method that’s right for them. Instead of a health care provider picking it out, the woman herself selects the method based on her lifestyle, age and health history. Tools could be developed, such as questionnaires, to help guide the woman’s choice, and advise her on what to do if she’s unhappy with her method. Contraceptions that are not self-administered, such as implants or IUDs could also be sold, then brought to a health care provider for insertion. Having the choice in front of her makes a woman aware of the variety of methods and puts her in control of what she uses and when. Lady business vending machines could stock a range of female products, designed to inform and educate a woman on doing what’s right for her body. 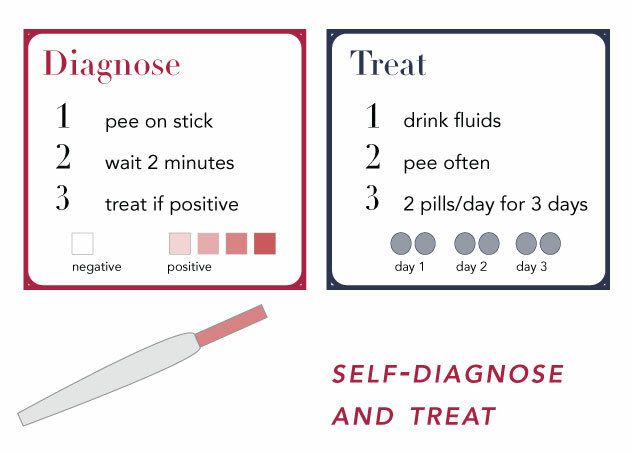 Self-diagnosis and treatment kits could be created for common infections, STIs, using simple dipstick or swab tests. The technology for many of these tests is very low-fi, and could involve taking a test strip into a stall, using it, and seeing results in minutes, then following advice to purchase a particular treatment, right there out of the machine. Test strips could be free, so you only buy the meds you need. 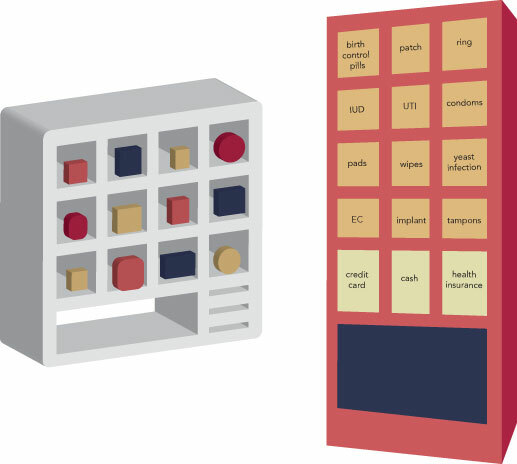 Contraceptions such as birth control pills, patches, rings, condoms, female condoms and other self-administered barrier and hormonal methods could be sold from a vending machine. In many other countries, hormonal contraceptions like pills are already sold over the counter. An advanced care clinician at CMU’s student health clinic said that foreign students who come here are often surprised they have to come in for a medical exam and a prescription just to get birth control. They’re used to getting contraceptions over the counter. Women with a range of free choices of contraception are more likely to pick IUDs over other methods, 50% opted for IUDs in a Wash U study. Women with a larger supply of birth control pills at home are more likely to stay on their prescription over time. (Source: Obstetrics & Gynecology) Yet insurance companies limit how many packs they will pay for at once, usually a 30 to 90 day supply. Some women use birth control pills for years at a time. Some for decades at a time. I am seeking to push change in attitudes about women’s health. 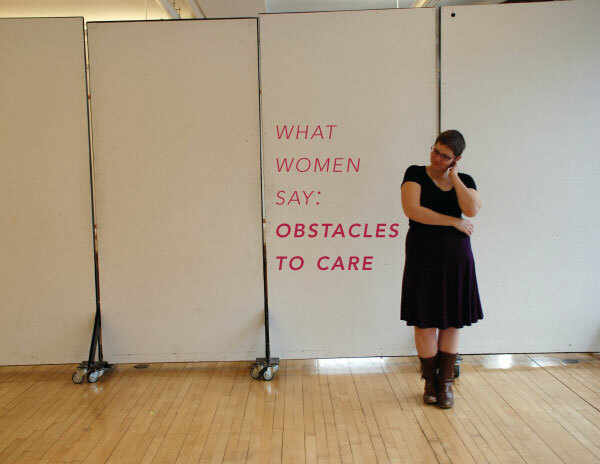 The vending machine concept questions the wisdom of the current state of women’s health care. My project proposes a possible future where we shift to a low bureaucracy model of health care for everyday needs. It focus is on educating the woman herself, and putting her in control of her health care. The vending machine isn’t designed to conform to the restrictions and bureaucracy of the current model, but is a proposal to change the model of care. Photographs by Jessamyn Miller except where noted below.